The Astonishing Excursions of Helen Narbon & Co, Chapter One. Oh, boy! The first installment of the Victorian serial! This ended up being one of the most popular features in Narbonic. It came about because I was whining and complaining about having to think of something to post on Sunday (a weekly ritual for six and a half long years), and my roommate, Mark, suggested doing a Victorian steampunk serial. He also showed me how to use the duotone setting on Photoshop to create sepia. Thanks, Mark! 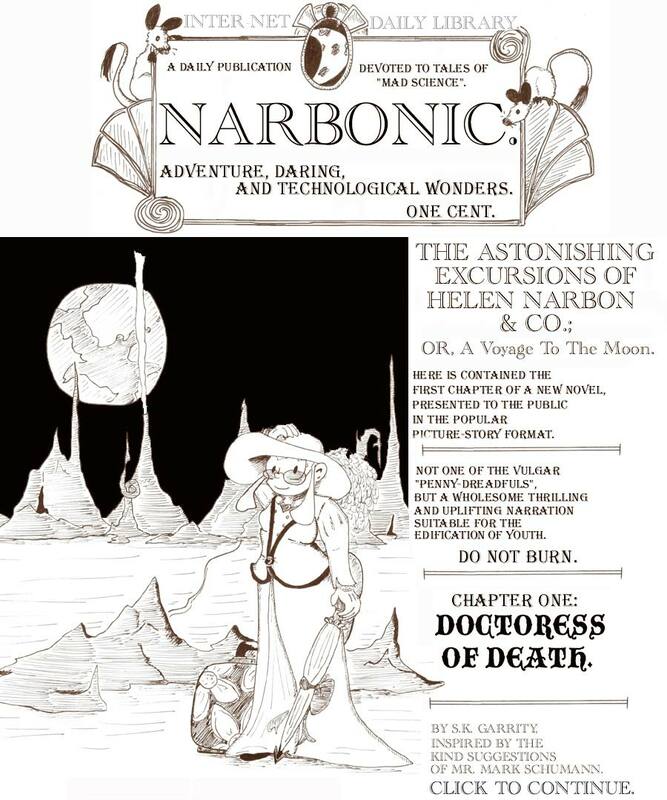 I always intended to follow the Victorian serial with other Sunday serials, particularly a Silver Age superhero comic, but it took me the rest of the run of Narbonic to complete this one. I kept this cover for every installment of the serial, despite the fact that the illustration is pretty bad. I couldn’t even draw a circular planet Earth. Sigh. The masthead with the gerbils isn’t too bad, though. My name on the penny-dreadful cover is “S.K. Garrity” because I’m concealing my identity as A Lady. The costumes aren’t too historically accurate. I looked through a lot of pictures of Victorian dress on Google, picked what I liked, and didn’t pay much attention to decade. Helen’s outfit is based on women’s clothing from the 1880s, if I remember correctly. Dave’s outfit is from a similar period, but I think I made most of it up. 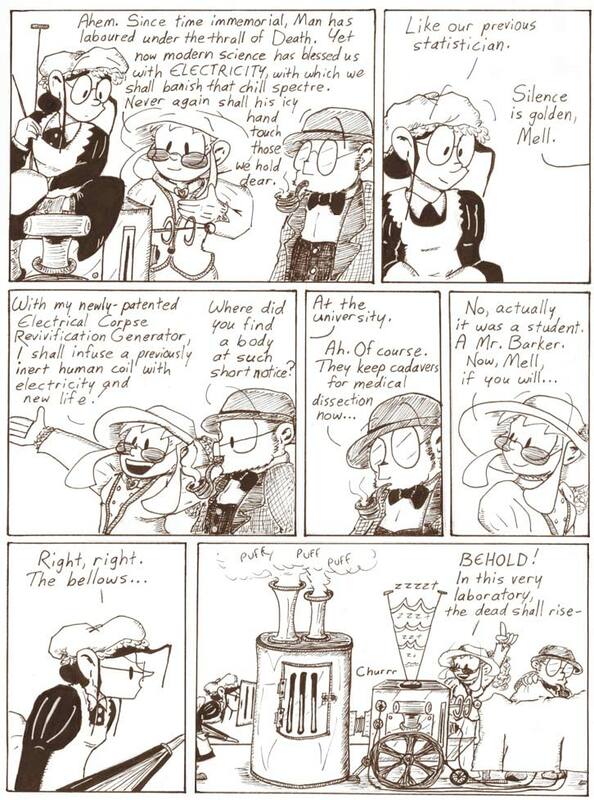 Professor Madblood, when he appears, wears a morning coat from around the turn of the century. It was, of course, a lot of fun to design everyone’s Victorian counterparts. 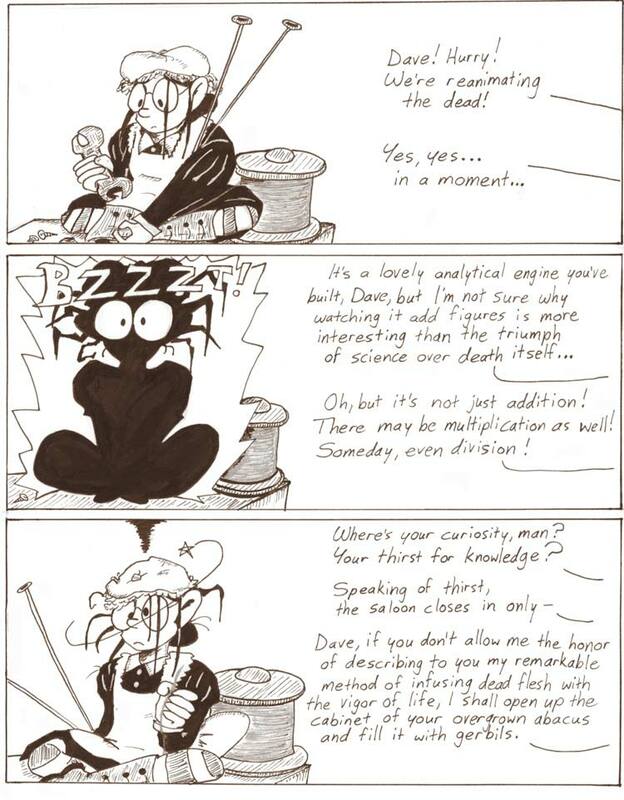 You can’t see this in the scan, but I inked the spool of wire with copper-colored ink. There was no good reason to do this, especially since it didn’t show up in the scan anyway. The array in the last panel is pretty good. And I like the idea of a Victorian Dave Barker. Maybe you have to know Dave Barker, but it’s pretty awesome. Man, five pages of Victoriana. This would not be the norm for the Victorian serial; usually I’d stick to three or four pages, on account of my laziness. In fact, I think the only installment that’s longer is the final chapter, which is six pages long. Also: had this been another era, the next chapter would have invariably involved flying zombies. “Time to return to my rat-infested flat and call it a night.” Does this line perchance contain subtle foreshadowing that, later on, Mell might not want to return to Earth? “It’s alive! It’s ALIVE!! !…Oh, wait…nope, it’s still dead. 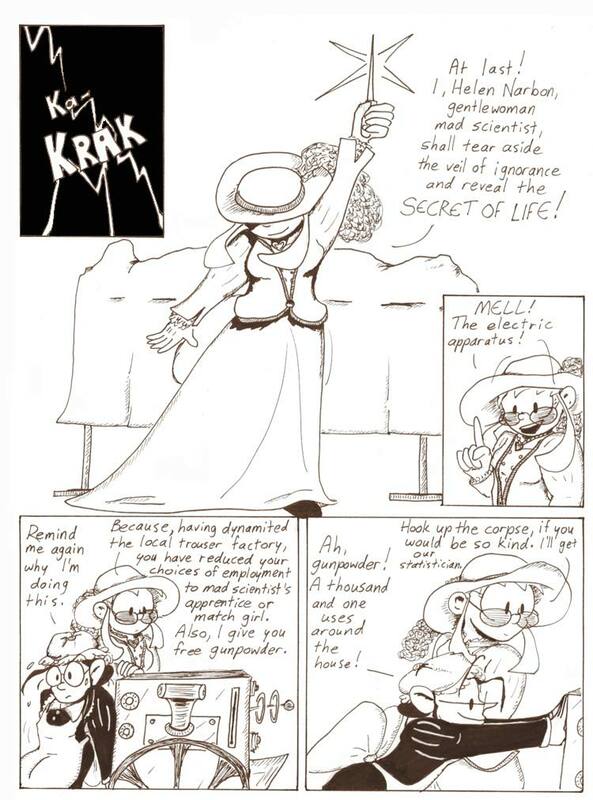 Crap!” – Some Horror Movie parody that I can’t remember the title of at the moment. 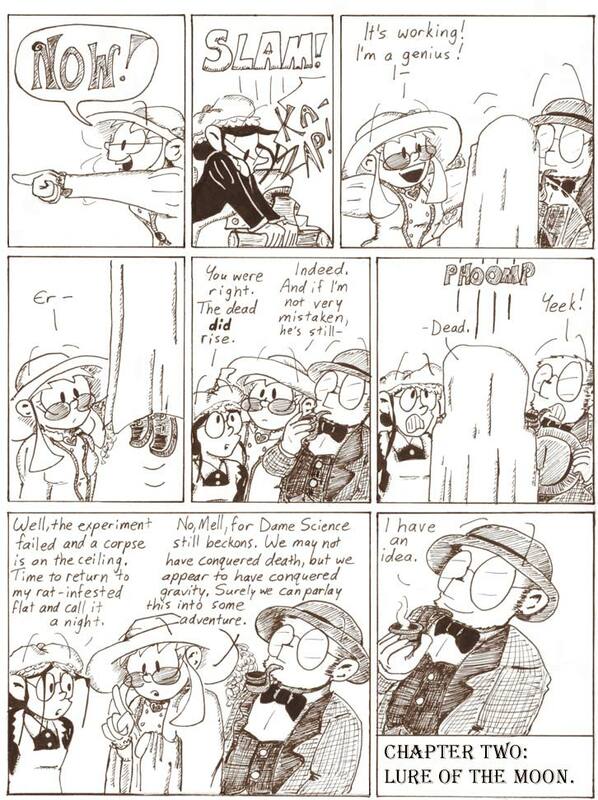 “Girl Genius” on hard drugs!